When I first began reading Secrets by Kristen Heitzmann, I was a little intimidated by its length since the average book I read consists of 37,000-50,000 words. However, having read a stand alone title by the author in the distant past, I decided to re-visit her - and The Michelli Family Series caught my attention. Little did I realize several months would pass before I got around to reading the first book of the series but, when I started, I was drawn in like a moth to a flame. That being said, each night when I set the book aside to get some sleep, it seemed like my overall progress was very slow, that the characters would travel through life with me. In some ways, I believe they will because they are so richly drawn. Lance was on a mission for his grandmother who had been hospitalized with no way to communicate except through gestures. He sensed the urgency behind her request and proceeded to go through her room in hopes of finding something that would trigger a reaction. At last, he found a set of letters - one, in particular, which drew her attention, especially the return address. He was able to infer that she wanted him to visit the woman who had sent her the letter. Soon, without a word of explanation to anyone, Lance was on his way to see an elderly distant cousin in a convent. After spending a few weeks with her, he decided to visit his grandmother's ancestral childhood home and immediately sensed that he belonged. He wanted to find out the mystery surrounding the villa - why his ancestors had been forced out and what happened to them afterward. Little did Lance realize the direction his life would take, especially when he came face-to-face with fiery, independent Rese, who bought the villa his grandmother lived in as a child. With plans to turn it into an inn, as she renovated it, she followed her instincts in hopes of preserving its character. As opening day approached, Rese became aware that she needed more of Lance's help than she, initially, realized. Lance became the essence of the inn and, soon afterward, made an imprint upon Rese's heart and soul. However, Lance had not been forthcoming with Rese about his intentions for coming to the inn on the first day. He would later admit that he had come looking for answers, but there was still a lot left unsaid. 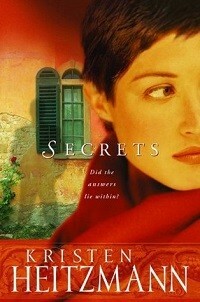 That being said, Rese had secrets of her own - life events which happened that she preferred not to share. Furthermore, she learned of secrets surrounding her life, sending her reeling with the emotional ramifications of it all. When the reason for Lance's arrival at the inn became clear, I had to wonder if their fragile relationship could weather the ensuing storm. Heitzmann has created well-rounded characters with life stories I'm glad are not my own. I empathized with her characters and, quite often, found myself in a position of trying to impose my personal convictions on Lance - hoping he would listen to me and not get himself into a heap of trouble with Rese. I am looking forward to reading the remaining books in the series and will be sure to share my thoughts here at Budden Book Reviews. To learn more about this title, please visit its page at Amazon.